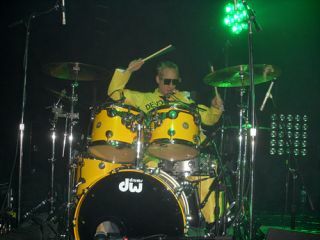 We love Josh Freese here at Rhythm. Not just for his incredibly varied drumming CV, but also for his sense of humour. And boy does his new solo record prove that he likes a giggle. The NIN/Vandals/Sting/anyone who's anyone drummer has dropped his My New Friends EP and, just as with 2009's Since 1972, he's offering a few interesting packages for those after a little more than your average extra tracks and live mixes. While $5 gets you a digital copy of the EP, those shelling out $50 will also get a phone call from Josh thanking them personally. But that's nothing, parting with $7,500 means you can "evoke spirits" with Josh, Tommy Lee and NIN bassist Danny Lohner. We're not quite sure what that means but we think it sounds worth the cash. If you're feeling really flush Josh will join your band for a month, give you one of his kits, write an EP all about you and give you 500 copies of My New Friends. All you have to do is hand over $75,000. Anyone fancy clubbing together?